Hello everyone...How r U all doing today??? 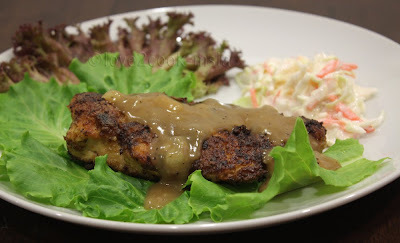 Here, I present...the premier show of love2cook's Chicken Steak!!! Errr...am I missing him too much until I keep doing his recipes lately??? Combine egg, all sauces, blackpepper, cornflour and salt. Mix well. Put in chicken pieces, coat well and leave it to marinate for 20mins. 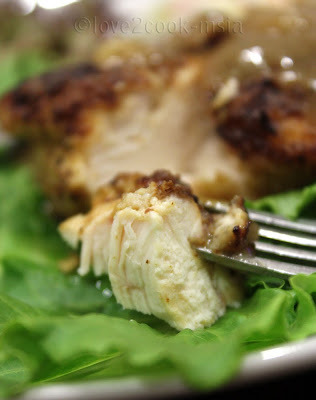 Once the underside has cooked, turn the chicken and let it cook again. Add chicken stock cube in boiling water...let it dissolve. Set aside. Heat pan. Add wheat flour and fry till golden brown. (Do not use oil). Pour the chicken stock broth into the pan, add all sauces and blackpepper. Stir well until the mixture boils. Add sliced onions and mushrooms. Mix together and turn off flame. 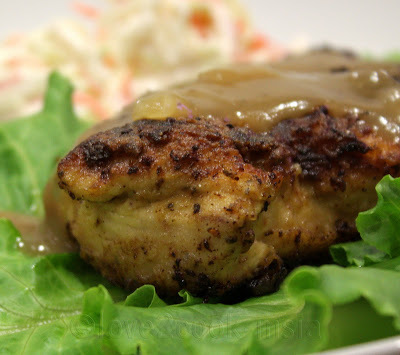 Pour the sauce on chicken steak before serving. 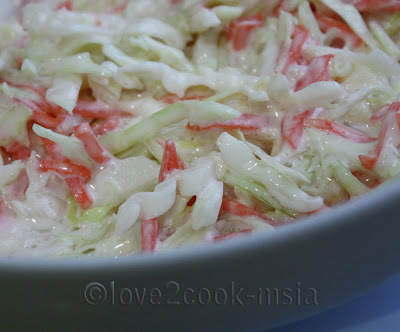 Mix cabbage and carrot with coleslaw dressing. Serve chilled. It's simple right? Try it! Wowww omg..am drooling here rite now...so tempting.....mouthwatering here..
woww...sedapnya love!!!! resipi pun so simple. should try one day!!!! wow...mabeles! set yg lengkap.... caya la love! kfae kena try jugak nih! tp sebelum tu boleh try kat cni tak? hehehe.. nak satu set!!! 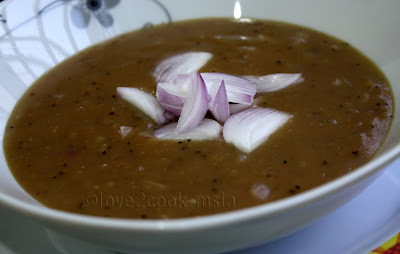 ni yang tak tahan nak mkn ni......luk sooooooooo yummyy...i aso wan!!! 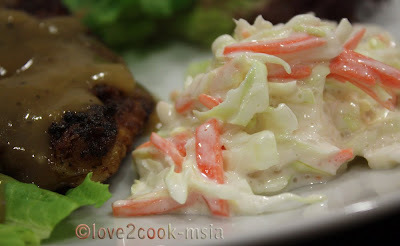 Minta sikit chicken steak tu Love, cukup dgn coleslaw dan sos...delicious!! that sounds absolutely appetizing and richly accompanied with the vegetables, a perfect dinner!!! interesting n inviting..looks so deliciously tempting! 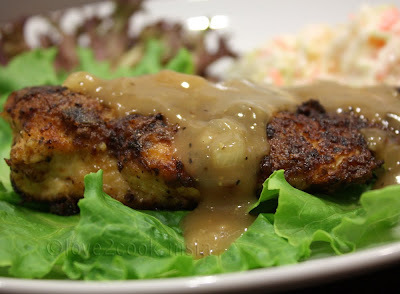 Kak Fa'e ~~> Owh, akak nak test dulu erk...okok come..here U are a set of chicken steak! Sedap tak kak??? 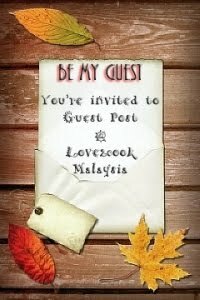 hihihi :) nnt try ye kak! the chicken steak is in the pan and i'm in the middle of making its sauce. i realised that you wrote wheat flour in the ingredients and cornflour in the instructions. just wondering which type of flour you use. thanks. That was a typo-error. It should be wheat flour.